I am delighted to announce the Schwab Foundation’s 2016 Social Entrepreneur of the Year awardees, who will join the world’s largest network of late-stage social enterprises affiliated with The Schwab Foundation for Social Entrepreneurship, the sister organization of the World Economic Forum. Nearly half of this year’s winners are women, a fact I am extremely proud of. This year’s awardees are experimenting with business models, innovating new distribution and replication methods, and holding themselves accountable for results – and bringing about transformative societal change in the process. Take Nina Smith of GoodWeave. GoodWeave works to eliminate child labour from the global carpet industry by intervening at both ends of the supply chain. At the retail end, GoodWeave has recruited 140 global brands including Macy’s, Restoration Hardware and Target to sell only carpets certified to be child labour free. It also conducts unannounced inspections at production sites in India, Afghanistan and Nepal. GoodWeave estimates that the number of child labourers in the carpet supply chains has been reduced by 80% in large part due to greater consumer awareness and effective certification protocols, and the organization aims to eliminate child labour in the rug industry by 2020. Another 2016 awardee is Ron Bills of Envirofit, which has to date sold more than 900,000 clean cookstoves, impacting over 5 million users, reducing CO2 emissions by 15.3 million tons, and saving their customers over $120 million in fuel costs. Clean cookstoves are also a critical tool in combatting indoor air pollution, a global health epidemic that kills more people each year than HIV, malaria and TB combined. Traditionally, however, clean cookstoves were low-quality, had clunky designs, and were offered in government giveaway programmes – leading to poor rates of adoption. Envirofit broke through those challenges by creating a market-based approach to distribution, embracing human-centered design to develop a range of high-quality products appropriate for different cooking cultures, and investing in manufacturing capacity in regional hubs in emerging markets. In Morocco, Yasmina Filali created the Fondation Orient Occident in the 1990s to provide young people with vocational training in growing sectors such as hospitality and IT at its six training centres. In recent years, with the influx of migrants and refugees from Syria, Iraq and sub-Saharan Africa fleeing conflict and economic stagnation, Yasmina Filali expanded Fondation Orient Occident’s mandate to work with this population – providing training and psychological support, among other services. Recognizing that a direct service model was simply not a sufficient response to cope with the challenging situation, in 2014 the Fondation Orient Occident also played a critical role in securing a legislative victory enabling refugees to work in the country legally. More than a decade ago, Jean-Marc Borello was awarded the Chevalier de l'ordre national de la Légion d'honneur for his significant contributions to French society as the founder of Groupe SOS. Since then, Jean-Marc and his leadership team have incorporated numerous structures into Groupe SOS and created new ones. Today, the group comprises 330 distinct business units with 12,000 employees offering a portfolio of services including drug addiction treatment centres, retirement homes for low-income elderly people, a chain of hospitals in poor neighbourhoods, and temporary employment and training to support the long-term unemployed – all guided by universal principles: address social needs, provide market-based solutions, and focus on disadvantaged areas. 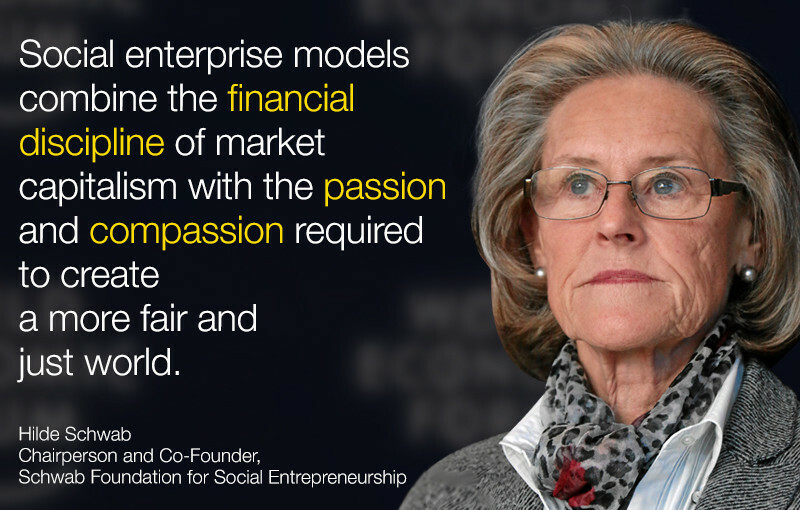 These models – and the models pioneered by all of our 2016 awardees, which I invite you to learn more about – demonstrate that economic growth and social inclusion can be generated by market-based social enterprise models that combine the financial disciplines of market capitalism with the passion and compassion required to create a more fair and just world.